A fifth shipping week in January helped reduce the year-to-year drop in Direct Market sales to the smallest dropoff we've seen since last spring, just under 2%, according to information released today by Diamond Comic Distributors. 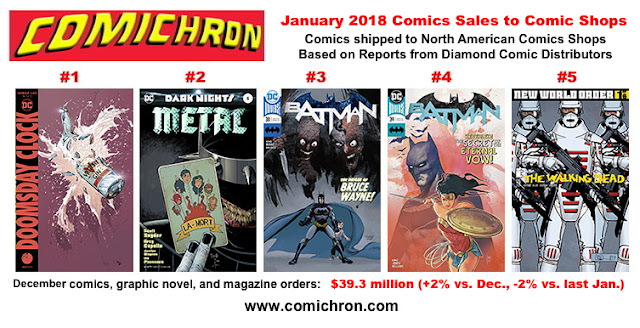 We've been reporting reorders and advance reorders for January comics at Comichron for weeks now; now, we finally have a look at how those reorders relate to overall sales. 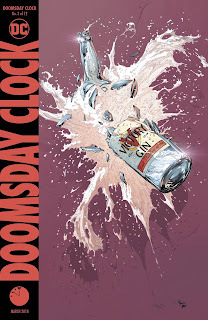 The quick line on the month is that DC had a strong opening to the year; the internal math suggests DC's dollar sales were up 15% over its total for January 2017, aided by the chart-topping Doomsday Clock #3 and Dark Nights Metal #5. Marvel was off, but high-single digits against what was a very unusual month for it last year. And that's an important matter: It's critical, first off, to ignore out of hand the unit sales drop, because January 2017 was the month that Marvel offered free overships of its entire line, distorting that category of the charts. Diamond shipped 6.71 million comic books to retailers in the month; to find a comparable figure without the overships we need to go back to January 2016, in which a little over 7 million comics were shipped. But the fifth week does not appear to have added much at all in terms of new comics releases; they were just up 5%, and at 478 new comic books that's the lowest number of new comics out per week since before 2015. Marvel only put out one more comic book in January than December, which had one less week. 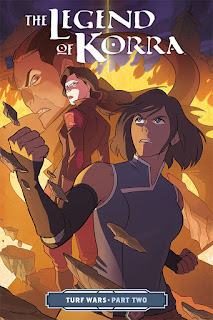 Dark Horse's 10 new comics for the month appears to be a 21st century low (though it had the top graphic novel by units in The Legend of Korra: Turf Wars Part 2, as we'll see below). Graphic novels, meanwhile, were where publishers shifted their attention for the month, with 23% more new titles shipping this January versus last. The result was a better month for graphic novels relative to comics, about with 560,000 copies shipping versus 527,000 last January. In dollar terms, graphic novels were up 4%. While the "dead quarter" pattern has been subverted in recent years, the first quarter of the year has generally seen fewer new high-profile offerings than in other times of the year; sales volumes are simply lower, and trends seen now — positive or negative — will have less effect on the year overall. The fact that DC has entered the year with momentum, however, does distinguish this year from last, and the fact that a new Robert Kirkman series is slated to debut in March could change the picture further. The market shares, below, were revised by Diamond after an erroneous table released. ...but also the Top 10 by Dollars Invoiced, or received from retailers. Marvel does a bit better here because of its higher prices relative to DC. Remember, you can sort any chart in Comichron's monthly sales section by either dollars or units. Take a look also, for comparison, at ICV2's new list of top Bookscan graphic novels for January. The book channel's tastes don't always have much in common with the Direct Market's, but the comparisons are interesting. The full data should be along on Monday. Enjoy the Olympics!